Stranded at Teterboro! Mooney Tire Mission Part I – EHFC Members Talking! Last Friday I planed a short trip to Teterboro to get a little more experience in the busy NYC airspace and some night time on the return flight to Ithaca. I flew this route three times before and each time has been a great learning experience, including asking NY approach for an IFR clearance in the air and some trouble with a poorly closing door. This time wouldn’t be any less interesting. There are many possible routes from ITH to TEB, only one of which I experienced going through “as filed”, KITH-HNK-V167 -WEARD-V489-COATE-KTEB. On the day of the flight there was an Airmet Zulu for icing only above 10 000 ft but considering the temperatures aloft it looked more like there was a freezing level around 9 000 ft which made me wondering about icing even at lower altitudes. Thus, my plan was to stay as low as possible in warm air. I filed to fly via airways which allowed an altitude of 5 000 ft, well below the freezing level. It turned out that ATC did not share my careful considerations and the clearance I got involved direct segments at 7 000 feet. There was no forecast icing at that altitude and I knew that in case I would pick up any ice I could descend to 4 000 ft on nearby airways so I decided to continue. Also, all of the airports along the route reported VFR conditions so I would always have a safe way out of the clouds. The flight itself was uneventful until I ran into some trace ice that started to build on the windshield. Fortunately, that occurred very close to my destination so I got a lower altitude right as I asked for it. Flying a Mooney into Teterboro always has the excitement that it feels like everyone else is going at least twice as fast as you are. During the descend, at an airspeed of about 180mph, ATC asked me to “maintain present speed or faster” which is hard to do in level flight with a Mooney, but the usual ILS 19 approach worked out fine and I safely made if off the runway, just before the traffic behind me touched down. Every time I flew into Teterboro I used Signature so this was my planned FBO. (It turns out Meridian is cheaper for both handling and parking, but I only learned that the next day). Originally, I wanted to get some dinner and depart the same day, using my night return privileges to get back to Ithaca. When I checked the weather, however, the ceiling at Ithaca had dropped faster than expected and combined with the icing at 7 000 ft I decided to stay in the city for the night. I did not want to deal with a night IFR approach into Ithaca with possible icing. There is a direct bus going from the Teterboro airport to Manhattan that runs about every half hour, so the friendly staff at Signature gave me a ride to the bus stop (about 15-20 minutes walking). It just takes about 30minutes to get to Port Authority but the few times that I used this bus it was reliably 20minutes late (something to keep in mind during winter or you’ll be as cold as I was!). After spending the night in an overpriced hotel in Manhattan I headed back to the airport to finally return to Ithaca. While the ceilings at all airports along the route had improved to 5000-6000 ft the temperature decreased significantly so I had to expect ice at 7000 ft. As our Mooney is not equipped for flight into known icing conditions, this only left me with a VFR return below the clouds. Apparently, that was what everyone was doing that day because just before I got my transponder code for VFR flight following two other aircraft canceled their IFR flight plans and asked for VFR departures. After a thorough preflight inspection (including inspection of the nose wheel condition) I asked for taxi and was cleared to runway 1. As I arrived at the runway I stopped to complete the usual run up: mixture rich, 2100rpm,… Right after increasing the throttle I noticed that the nose dropped noticeably so I reduced the throttle immediately to see what was going on. The first thing I double checked was the gear switch and gear indications, which all indicated gear down. But when I tried to let the plane roll a little, it would not move an inch and the steering was extremely stiff. At that point, for the first time, I asked tower for assistance with an actual problem. He promised to have someone out shortly. 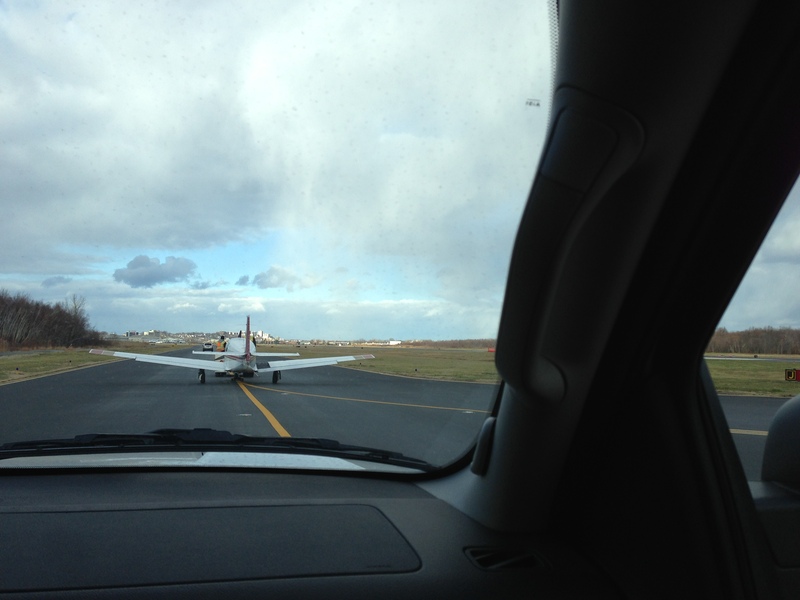 Fortunately, there was enough space next to me to let the plane behind me pass. As they taxied past me their comment was “So it looks like that Mooney has a flat tire!” So that’s what was going on. I shut down the engine because there was nowhere to go and waited. The friendly manager of airport services arrived quickly and invited me into his car to figure out how to resolve the problem. He started calling FBOs on the field to see if they could handle a flat nose wheel and transport the “disabled aircraft” off the taxiway. The first FBO that offered help sent a truck and a tow bar to us. The first thing they wanted me to do was to sign a liability release form. It turned out that their plan was to just tow the plane as usual and then see what would be left of the nose gear. This did not seem like the smartest choice and I did not want to be responsible for having signed that someone can destroy our plane. I declined and asked to call other FBOs. 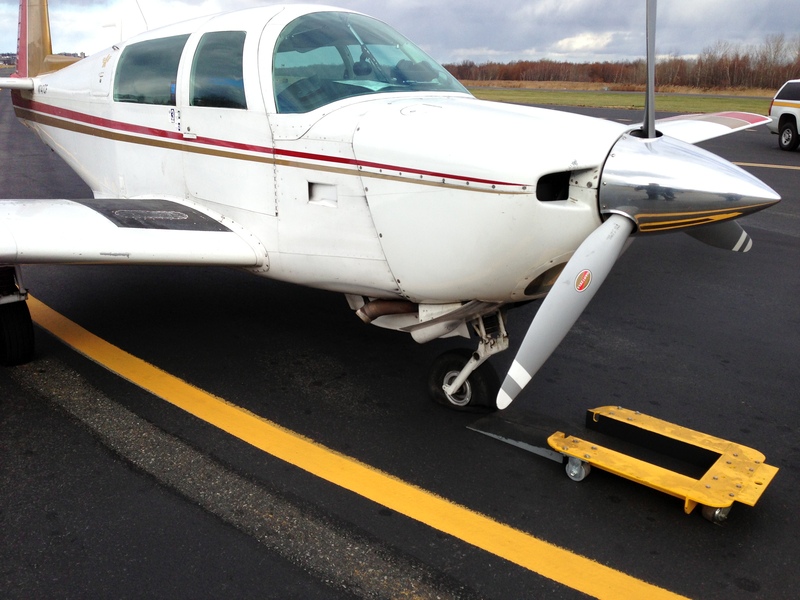 Finally, after about one hour on the taxiway, Meridian sent their mechanic with the right equipment to get our Mooney. What they did was to place a dolly below the nose wheel which allowed the plane to move. They did not even ask for a liability release form. Once at the Meridian FBO we discussed with Nick (the Meridian mechanic), David and Adam what would happen next. It turned out that there was no way the Mooney would get a new tire and tube the same day so I made my way back from Teterboro via bus. It’s amazing how far you can get in a small plane in just an hour, especially if you have to travel the same distance by bus! I departed Teterboro at around 4pm and was back in Ithaca just before Midnight.